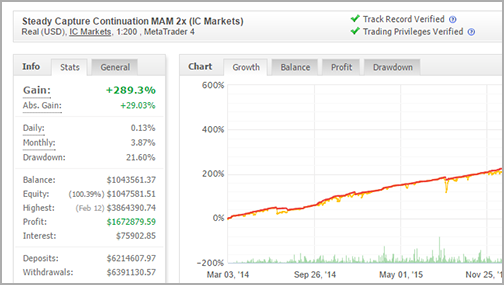 Get access to highly experienced institutional traders through one of our Managed Accounts (MAM/PAMM). Our traders are among the best in the business, all of whom have proven their ability to make money for our clients over several years. Did you know that our traders are generating 30 - 100% annual net returns? Did you know that you can allocate your own capital to any of these traders and have it traded on your behalf? If you would like to take a step towards building wealth for you and your family and prefer to leave the job of trading to professionals with a proven track record, we’d’ like to invite you to invest with one of our traders below. Since our inception in May 2012, we’ve grown to support thousands of clients from all over world (including USA) with tens of millions of dollars under management. Simply click on one of the links below to discover more about each trader, if you get stuck or need help at any time, please click on live help link on the left hand side. Steady Capture is controlled by a manual trader from Canada with over 10 years experience generating returns from the markets. 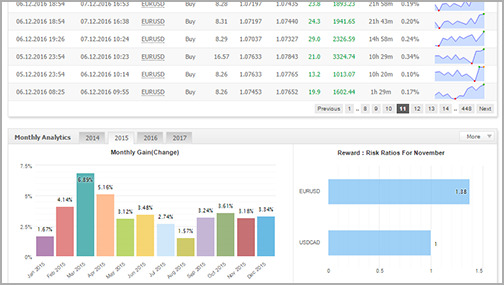 He uses multiple time frames to identify high probability opportunities across all the major currency pairs as well as Gold and Silver.